I bet that fishing can’t be the popular travel idea for many travelers for now. That can be understood ever since many of us are staying away of where the fishes are living. For some others, fishing may too smell to be considered as the sport. 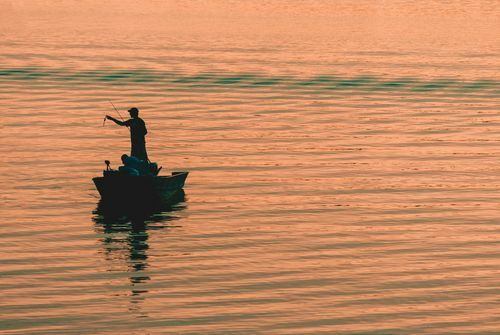 But no matter the pro and cons about going out for fishing, I will keep on doing it every time I got a chance and today, I will suggesting you to get your own fishes while paddling the canoe for some reasons. For the first reason you may not expected is that, fishing on a canoe has been my own routine since i was a kid. And for some reasons, that can also be as interested as your think. It is good for your exercise especially the upper parts of your body. Paddling on a canoe will allow your upper parts to be moved. If you are doing it regularly, it can even be your self-program to make your body in shape. Fishing will then complete the rest parts of the body since it will really move almost all of your organs. Giving you new experiences. Paddling the canoe may not as special as the other activities while traveling. But you will never know that you may are seeing and thinking about things differently. Who knows you can get some positive ideas about works or your own life while fishing on it. Simply open your mind to many things. The famous gravity formula itself was inspired by someone who are resting under the apple tree. And you knew who was that, right? Take you deep to the untouchable spots. Fishing on the boat may are interesting. You can even feels safer on it. But, you have been realized that its size may not fit or too big when you are going to get to the mangrove forest at the sea or the river. But that won’t be happening when you are suing the canoe where you can reach more spots and area than the speed boat itself. It will possible for the new exploration and discovery then. It will be fun because you can even invite your kids. If you are thinking about the canoe, kayak and rafting, the possible boat that can be kids-friendly is the canoe itself. It has room where a child at least can sit or sleep in it. Rafting may do has the same thing, but surely that it will rarely be used at the sea and for fishing. Nowadays, the lightweight canoes have been available. Have you ever seen someone put a canoe on the shoulder while heading to the sea or beach? That will be the undeniable life proof that canoe can be took anywhere. It is just has a problem where you can folding it. That’s it. Anyway, canoeing and fishing has been the great match of activity you can do and both are also things that have been doing for decades or even centuries. ← What to Look For of 5 Bedroom Villas Seminyak – Petitenget, Bali?